Tech gifts are expected to top the Christmas wish lists of thousands of Brits this year, with home assistants, fitness trackers and virtual reality (VR) headsets among the most sought after presents. Socks and smellies are a given, but there’s often a little added bonus hidden at the bottom of our stockings and after a questionable few years, VR headsets look set to become mainstream in homes for 2019. VR has grown exponentially in the past couple of years, broadening its appeal from gaming, through to tourism and education. 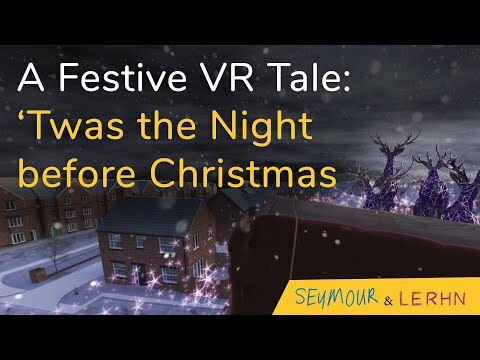 With just four weeks to the big day, we’re delving through the archives to bring you some of our Christmas creations from years gone by - in VR, of course. First up, we’re re-visiting last year’s tale of a sleepy house and the quiet anticipation of Santa’s visit. ’Twas the night before Christmas is our spin on a traditional tale; a festive 360 insight into a magical Christmas story... and you may even spot a glimpse of Santa himself!